Christmas may be over, but the presents keep on coming. This is a bumper bag of goodies for you too all have a peek at. Come and check it out. My name is Maciej Stankiewicz. I’m 35 years old. Now I live in Warsaw, Poland. 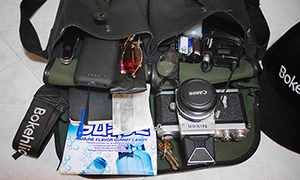 At the beginning I’d like to say that I enjoy “In Your Bag” articles a lot. 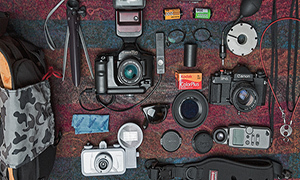 It’s very interesting to see what gear people are choosing and, at the end, see their results in the galleries. What interest me the most is a “Street Photography” – to capture an interesting scene before it goes. Be invisible and fast enough. 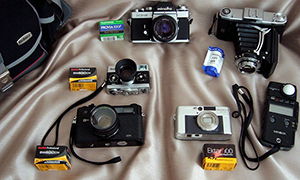 I decided to show few of my cameras selected from quite a collection. Presented cameras are the few I would need for any project. There is much more beautiful cameras that I enjoy using as Voigtlander Vitomatic IIa, Minolta Hi-Matic 7s or Hi-Matic E but these are my favorite and most important to me. My favorite type of camera would be a good SLR… but for what I’m doing (street/people/candid) a black quiet rangefinder or other quiet camera is a must. 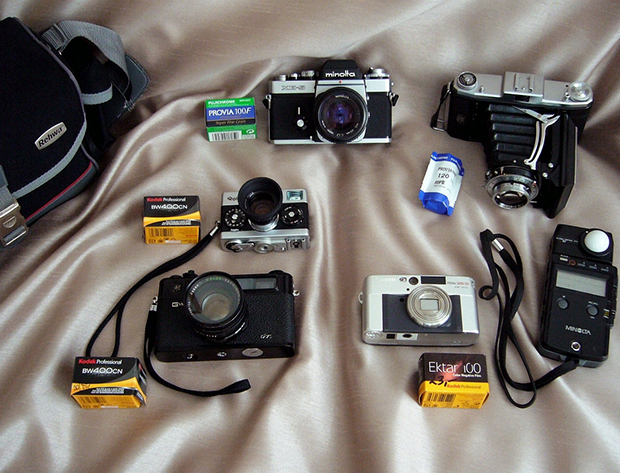 My everyday camera is YASHICA ELECTRO 35 GT or little ROLLEI 35SE, loaded with fast B&W film (Kodak 400CN or Ilford Delta 400). The most important thing is the switch on the lens – not too many people know that switching GT from AUTO to flash mode gives you not 1/125 or 1/60s but nice solid 1/30s ant that is what I need for low light, to freeze what’s going on. (1/15 would be nice too). My second choice for an Everyday camera is ROLLEI 35 SE. Beautiful camera, very solid, heavy, all-mechanical camera with excellent 40mm f2.8 Sonnar HFT (High Fidelity Transfer) lens. Very sharp and contrasty lens. Marvel of German engineering (Heinz Waaske). Rollei 35 is the camera that you love or hate from day one. I Love it. Because of the quality. 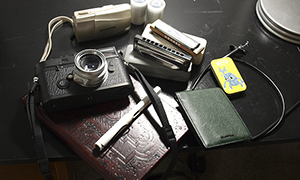 As a backup for the cameras mentioned above there is always small AF camera with flash and ISO100 film. (here: Canon Sure Shot Classic 120, sometimes Olympus Mju 1) Just for the flash and pictures where I need contrast and actually can shoot without risking injury..
MINOLTA XE-5 I Love this camera. My first choice for vacation and other “non-street” pictures. So smooth, wonderful, specially designed Copal shutter. All the knobs and adjustments are where they should be. Classic elegant design. Very heavy and solid what I like. Without batteries you still have B and 1/90s which will save you most of the time. I’m using it with many MD lenses mostly 28mm, 50mm f1.7 or 35-70 f3.5 zoom. A workhorse. And it’s on the top of the picture for the reason. Then comes the 6×9 Zeiss Ikon…. Properly adjusted, clean lens with hood and 6×9 surface of modern emulsion gives excellent quality, sharpness (when stopped down) and smoothness. Micro contrast makes pictures to really pop-up. Seeing 6×9 slides is also an amazing experience and lot of fun. Minolta Lightmeter is here for the reason. I use it when shooting medium format slides. By the camera you can see my favorite film that I use for that particular camera. My bag is a small Rehwa bag. Really nice. Thank You. Enjoy. Keep Shooting on Film! 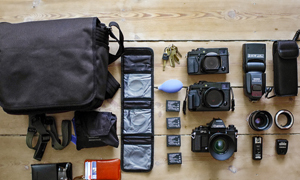 Thanks for sharing your gear with us Maciej. Keep on shooting film and enjoy that Zeiss Ikon, it is a stunner. A really nice set of cameras, thanks for sharing. I really like your set-up and the thinking behind it. Very interesting. Wondering whether the lack of a ‘high end’ interchangeable rangefinder (read ‘Leica’, ‘Zeiss’ etc.) is a conscious decision? Cheers and best of shooting for 2014. Someday I’ll get Black M4-P. I like it a lot.